An unrehearsed rendition of “Come Thou Fount of Every Blessing” echoes down the Maeser Building’s marble hallways. From the front of the classroom, Richard A. Gill (BS ’93), associate professor of biology, tells his 30 students that he loves the hymn because it depicts “the great effort and discipline that are required to reconcile us to God.” And the goal of this class—Unexpected Connections—is to “do a very small version of that, asking you to reconcile two ways of viewing the world,” he says. letters. In this section Gill and Matthew E. Mason, associate professor of history, are addressing the causes and consequences of revolution. 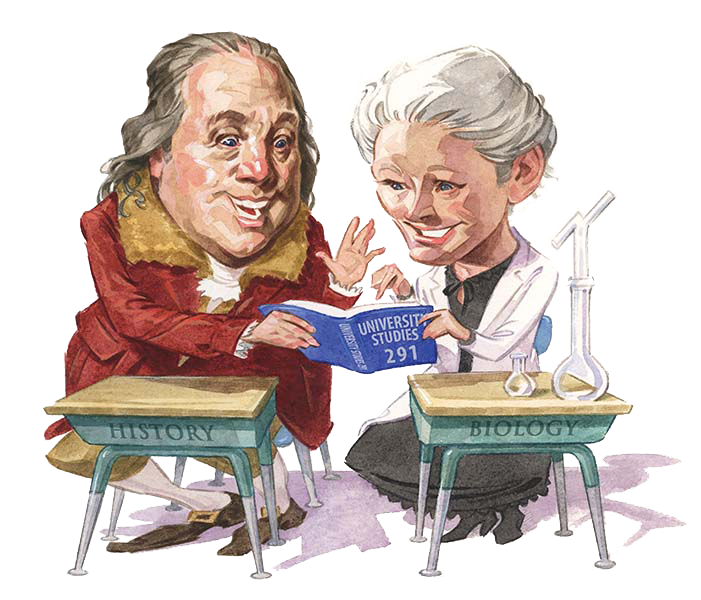 “So let’s look at this historical view of revolution like a biologist,” Gill suggests. Any revolution—political, cultural, or technological—is preceded by “a motivating factor, some sort of inefficiency in the system,” he says. After weeks of insights from history, students are ready to explore today’s digital revolution. For two weeks they adopt the role of digital revolutionaries, shunning paper and pen and voice calls for blog discussions, e-mail, texting, and Skype. The next two weeks, they become counter-revolutionaries, leaving their phones at home whenever practical, writing in analog journals, making personal visits instead of calling, reading books, and doing research in the library stacks. The final two weeks, they are reformers, working to find a balanced approach. Gill found that in historical research, revolutions are displacing—an old model is replaced with something novel—whereas almost all scientific revolutions involve a synthesis, as in the case of evolution and genetics merging to form much of modern biology. “When we were identifying gaps in our knowledge and filling them in, I think that’s when the students really perked up,” he says.